Ingredients: If you liked the fish-out-of-water story of Avatar, the sci-fi-meets-fantasy aesthetic of Dune, and the space opera fun of Flash Gordon, you will love John Carter. Last year, a beloved pulp hero was completely botched in Marcus Nispel's Conan the Barbarian, starring Jason Momoa. While the film did not follow any plots from Robert E. Howard's Conan stories, it made the graver mistake of misinterpreting the characters, themes, and settings of Hyborea. 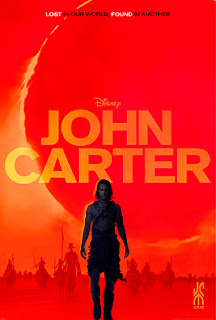 This year's John Carter, based on the pulp stories by Tarzan scribe Edgar Rice Burroughs, is a far better film. Sure, it takes liberties with the plot -- but the characters, the themes, and settings are all there, intact and brought to vivid life. This is the Mars I envisioned while reading Burroughs' stories -- pulpy, alien, with just a hint of camp. Taylor Kitsch plays our titular hero, a gold-hungry traveler and veteran of the Civil War. While running from Apaches, Carter stumbles upon an ancient cave and, upon finding an alien amulet, is transported to our sister planet of Mars (or as the locals call it, Barsoom). Carter, an Earth-man, is capable of great feats of strength and agility in the lower gravity of Barsoom, and this soon catches the attention of Tars Tarkas (Willem Defoe), the ruthless but fair chieftain of the local Thark tribe. The Tharks, towering, four-armed savages, take Carter captive, and the interplanetary traveler is caught up in the struggles of a dying world when he is forced to protect a princess, Dejah Thoris (Lynn Collins). Through the course of the film, Carter goes from wanting desperately to find a way home, to being fully embroiled in the battle between the city-states of Helium and Zodanga. John Carter is primarily based on A Princess of Mars, the first John Carter of Mars tale, though there are elements of other stories present as well. And though plenty of liberties are taken with the plot itself, this movie is immediately identifiable as a John Carter adventure, and it's an interpretation that I, as a fan of the original books, can get behind. It's great to witness this truly alien world and its various peoples. The Tharks, especially, are handled well, and if anything are underutilized in the film. The Tharks are savage and proud, and their ways are presented to us with a refreshing lack of boring exposition. John Carter does not understand their ways, and so we should not either. Willem Defoe supplies my favorite performance as the conflicted Tars Tarkas, and Samantha Morton, who plays the young female Thark, Sola, does a fine job as well. If there's something negative to be said of the film, it's that it goes by almost too quickly. Before we truly get a feel for these three distinct cultures, the movie is over, and we, much like John Carter, are taken from this strange yet beautiful place before we are ready to depart. The barbaric Warhoons, for example, are afforded mere minutes of screentime. The critical response to this film has been fairly mixed, but I have to say that I truly enjoyed watching Barsoom come to life on the big screen. This a charming, surprisingly funny, adventure-filled space opera, and it's a beautiful movie to look at. Want more info on John Carter? Check out our post on the stories behind the movie!